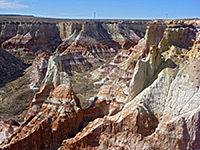 In the Southwest, badlands are a low relief landscape of soft, thin-layered, multicolored sedimentary rocks which are weathered into small hills, gullies and pinnacles, largely or completely lacking any vegetation, and occurring in generally arid environments. 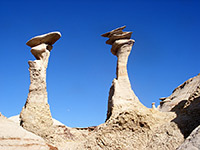 Some locations have rocks that are harder and more resistant than others above and below, giving rise to extensive arrays of hoodoos - fantastic eroded formations of every shape imaginable, and while the great majority of such places are remote and little-known, not part of national or state parks, they rank amongst the most photogenic landscapes around. 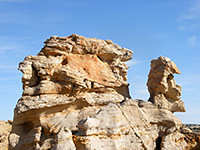 The appeal is generally in the small-scale details, the shapes, colors and forms of the rocks, rather than in the overall scene. 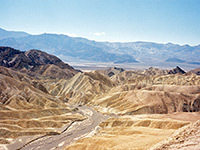 As with several other landscape features, badlands are best viewed on the Colorado Plateau of south Utah, northeast Arizona and northwest New Mexico, though the desert areas of southeast California and south Nevada also have a selection of eroded landscapes, such as Anza Borrego, Red Rock Canyon, Rainbow Basin, Valley of Fire, and sites in Death Valley like Twenty Mule Canyon, Zabriskie Point and Golden Canyon. 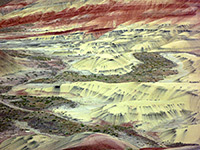 In Arizona, variegated rock strata are exposed in scattered locations across the Painted Desert, which is a broad, flat region that extends from near the Colorado River north of Cameron, 150 miles south and east towards Petrified Forest National Park, and indeed the north end of this preserve has an interesting mix of undulating hills and small hoodoos, in addition to the usual petrified logs. But even so, much of the Painted Desert is sandy and featureless - the interesting locations are small and isolated. 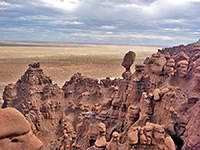 The desert is bordered on the east by Ward Terrace, a plateau beneath a great line of creviced, red/white badlands and ravines, stretching for over 40 miles, with many pretty rock formations, though this area is difficult to reach, needing long drives on remote tracks, deep within the Navajo Reservation. 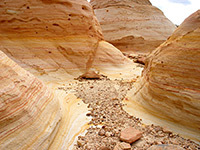 The cliffs line a big, flat, grassy expanse (Moenkopi Plateau), the far side of which breaks up into an even more colorful series of escarpments and branched ravines, all tributaries of Moenkopi Wash. 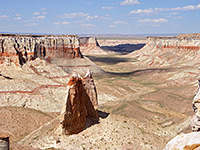 These include Coal Mine, Ha Ho No Geh and Bat canyons on the south side of the wash, and Blue Canyon on the north side, and the majority of this land falls within the Hopi Reservation, accessed by side roads either off US 160 or AZ 264. 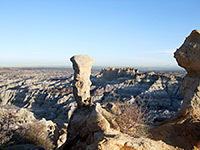 The formations spread across a pathless area 20 miles wide, so there is much scope for exploration. 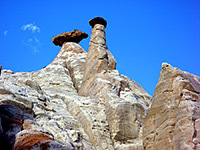 New Mexico also has one main badland region, in the northwest, where many shallow washes, tributaries of the San Juan River, have cut into the soft strata of Kirtland Shale and the Fruitland Formation - varied rocks that contain components of greatly contrasting colors, and have eroded into the largest areas of badlands/hoodoos anywhere in the Southwest. 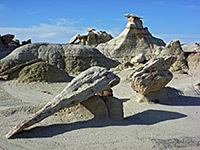 Major locations are Bisti, De-Na-Zin, Angel Peak and Ah-Shi-Sle-Pah, but there are also many smaller regions, some unnamed and all very little visited except perhaps Bisti which has become relatively well-known in recent years. 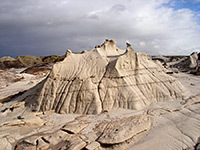 Other examples include the Burnham Badlands and Fossil Forest. 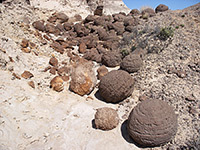 All these places have the added attractions of abundant petrified wood and occasional dinosaur fossils, and all are managed by the BLM, mostly as a wilderness area or wilderness study area. 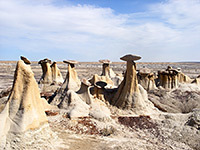 Further east are other badlands, still with petrified logs, such as Ojito, Ceja Pelon and Penistaja Mesa; here the hoodoos and eroded hills are generally less numerous and more overgrown, but are equally fascinating to explore, and have a similarly remote, high desert setting. 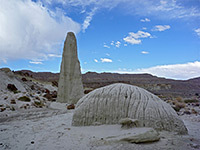 Badland and hoodoo areas of south Utah are more scattered, found in various places across the Capitol Reef, Grand Staircase-Escalante and Glen Canyon parks, and another locations like the San Rafael Swell, Goblin Valley and Factory Butte. 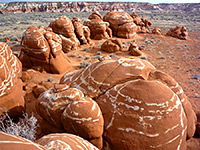 Perhaps the best region is either side of the Paria River, accessed by US 89; the Paria Rimrocks are a line of goblin-like rocks and colorful hills bordering the north side of the highway, while further east, the Wahweap Hoodoos are a similar but larger and more remote collection. 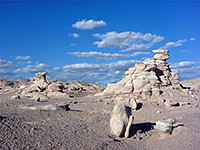 South of US 89, there are some badlands and other striking rock formations in the Coyote Buttes area (near the Wave), and places further east on the Paria Plateau, such as White Pocket, just over the border in Arizona, as well as other locations close to the Paria River further upstream. 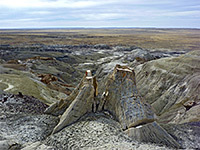 One other location of note, in a remote part of the Uinta Basin, is Fantasy Canyon, where pale badlands overlay a small but fascinating area of eroded, thin-layered rocks. 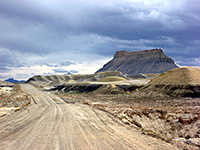 Some of America's most extensive badlands are found in the northern Great Plains states, especially Badland National Park in North Dakota. 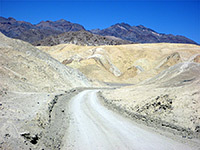 Another small but very beautiful region with a northerly location is John Day Fossil Beds National Monument in central Oregon. 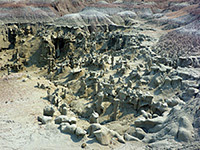 View all photographs of badlands.